Marton Kiss - Scaffardi Artists Management AGENZIA DI MANAGEMENT ARTISTI, ORGANIZZAZIONE E GESTIONE EVENTI. Born on 21th August, 1992 in Szombathely. He started playing the piano with age of 6 in the class from Mrs Lenke Németh in the Béla Bartók Musik School. In 2001 and 2003 he won the Bösendorfer Award in Austria, on the Prima la Musica competition, and also two times first prize. 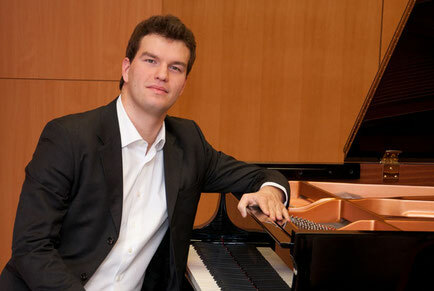 In 2003 he won in March in Budapest the Mozart Piano Competition. As special award he played on a lot of concerts, in Miskolc at the Opera Festival , in Budapest at the Spring Festival and Szombathely. He became student of the Music University in Graz, in the class of young talents. His first professor was Mrs Lioudmilla Satz. In 2004 he won Third Prize in Brno, at another Mozart Competition. In chamber musik with Mr Tibor Gyenge, they got First Prize in Székesfehérvár, at the Alba Regia Chamber Musik Competition. In 2005 he played Mendelssohn: Piano concerto in d minor with the Savaria Sympony Orchestra, the dirigent was Mr János Petró. In April he played with Mr Nikolaus Harnoncourt in Vienna in the UNO City. Almost 2000 people were attending the concert. In 2007 he organized a charity concert for kids in the hospital of Szombathely. In the summer, he won Third Prize in Munich, and also the First Prize of the Audience Jury and the Jury of Young Talents. In November he won First Prize in Usti nad Labem, in the Czech Republic, and another Special Award, for the best Liszt-arrangement. In 2009 he earned the Sándor Kiss Prize from the Rotary Club in Szombathely. In this year, he was supported of the New Europe Foundation. In 2010 he played Liszt Piano concerto in A major in Szombathely. In June he finished his studies at the János Bolyai Primary and Secondary Grammar School. He got the Honor Medal of the school. He made entrance exam to the University in Graz, his first professor was Mrs Milana Chernyavska, then Mr Balázs Szokolay. In 2011 he went in the Final Round in the Final Round of the Yamaha Piano Competition. In May he played in Rupperstal on a Pleyel-piano, which is one of those pianos, on which Liszt played also. Because of the Liszt-year he played on a lot of concerts, in Bük, Güssing, Szombathely, Sopron, St. Pölten. In 2012 he continued his studies in the class of Mrs Ayami Ikeba. He played many solo concerts in Austria and Hungary. He got the First Prize of the Competition of the Hungarian Consulant in Graz. In 2013 he played several piano concertos, Grieg, Gershwin, Haydn, Beethoven and Mozart. He was invited to a Piano Competition in Aarhus. He won again the supportation of the New Europe Foundation. In January 2014 he played Beethoven’s 3rd Piano Concerto with Maestro Tamás Vásáry in Pavia. In March he finished his Bachelor studies at the University of Music in Graz, since then he is Master-student in the class of Mrs Ayami Ikeba. In September 2 concerts at the LeXGiornate festival in Brescia, with Marco Feruglio and Andrea Oddone. In 2015 he got the Junior Prima Prize in Hungary. He attended the Forum per Tasti Piano Competition in Slovakia, where he went throught to the finals.